The Refuges and Precepts are not mantras, but they are chanted in a mindful way in order to connect our minds with the goal of spiritual awakening. So they have the same function as mantras, ultimately. The chant is in several parts. The words “Namo tassa bhagavato arahato samm&amacr;sambuddhassa” are chanted three times. This is a salutation to the historical Buddha, and it means “Homage (namo) to him (tassa) the blessed one (bhagavato) the worthy one (arahato) the fully and perfectly awakened one (samm&amacr;sambuddhassa). Since it was originally an orally transmitted tradition, Buddhism likes repetition, especially three-fold repetition. To the teachings for refuge I go. To the spiritual community for refuge I go. These are not commandments. Each precept contains the words sikkh&amacr;padaṃ sam&amacr;diy&amacr;mi, which mean “I undertake the training principle.” So there’s no compulsion; these are practices taken on in order to train the mind to be more compassionate and mindful, and not rules undertaken in order to avoid punishment. I undertake the training principle of abstaining from taking life. I undertake the training principle of abstaining from taking the not-given. I undertake the training principle of abstaining from sexual misconduct. I undertake the training principle of abstaining from false speech. I undertake the training principle of abstaining from intoxication. The early Buddhist tradition, as it’s been handed down to us, tends to emphasize what we shouldn’t do, although some of the suttas (Buddhist discourses) also stress the positive counterparts of the precepts. In order to acknowledge what we’re trying to cultivate, as well as what we’re trying to avoid, in the tradition I practice within (the Triratna Buddhist Community) we add five “positive precepts,” which are also part of the chant. 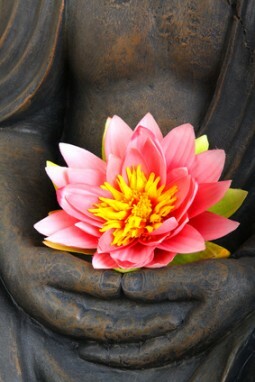 With deeds of lovingkindness, I purify my body. These meditation guides are very helpful – I love the little clips that allow me to hear you pronounce them. Thank you so much! Thank you for this. I really like the positive counterparts of the precepts. I have a question. As American Buddhists, can’t the chants be done in English? I have thought about other countries that practice Christianity, do they do the Lord’s Prayer, Ten Commandants, etc. in English? My thought is they probably use the language of the population. Just curious. I actually think it would be great to chant the refuges and precepts in English rather than Pali. I think it would be much more meaningful. The idea of chanting in Pali is that we can do this together as a ritual no matter what country we’re in. So I could visit a Buddhist center in Russia or Venezuela and we could all do the same ritual together. But there’s no reason we can’t do both. Thank you and thank you wildmind.org. Lots of good information and insight.